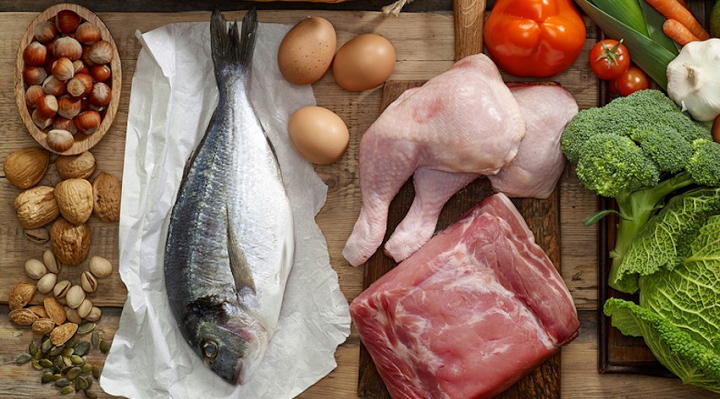 If the above are the ingredients you are using when you prepare your meals, your diet is almost certainly not a low carbohy-drate high fat, but a low carbohydrate high protein diet. Please mind the difference and don't brag in the comments about how great you feel on your "keto diet"! If you are an avid follower of the SuppVersity News on Facebook (revisit the post), you will remember Louise M. Burke's late 2016 paper which showed that a low carbohydrate, high fat diet impairs exercise economy and negates the performance benefit from intensified training in elite race walkers" (Burke 2016). Accordingly, Jørn Wulff Helge from the Center of Healthy Aging in Copenhagen, Denmark, wrote in his recent perspective article in The Journal of Physiology that "in elite athletes training and performing at intensities similar to elite sports competition, keto-adaptation is not the optimal dietary choice" (Helge 2017). Keto for Superior Weight Loss? Complementary results for less trained individuals has now been published by Urbain et al. (2017) in the peer-reviewed journal Nutrition & Metabolism - a paper in which the authors report an, albeit "mildly negative", impact of a 6-week non-energy-restricted ketogenic diet on physical performance (endurance capacity, peak power, and faster exhaustion)" (Urban 2017). Can these observations be surprising? No, they can't. After all, even the most dedicated keto-proponents, like Stephen Phinney acknowledge that "[i]mpaired physical performance is a common but not obligate result of a low carbohydrate diet" (Phinney 2004) - whether and to which extent the effects that were observed in the previously cited studies could have been fixed, as Phinney suggests using his notorious references to "traditional Inuit culture" by "optimized sodium and potassium nutriture, and constraint of protein to 15–25 % of daily energy expenditure" will be discussed in the bottom line of this article. First, however, let's take a look at the methodology and results sections of the Burke and Urban papers. Let's address one of the often heard criticisms of this study right away: the subjects didn't eat enough... true! During the three weeks of intensified training, the dietary intake was limited to 40kcal/kg and thus roughly 2400kcal/day, not increased to compensate adequately for the increased energy requirements due to high volume race walking, resistance training and cross-training (running, cycling or swimming | for details see Table 1). 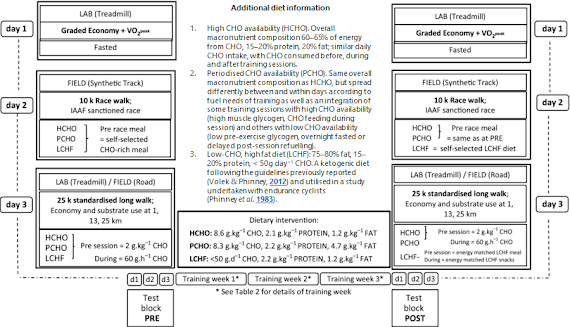 Table 1: Overview of weekly training-diet intervention involving high carbohydrate (CHO) availability (HCHO), periodized CHO availability (PCHO) or low CHO high fat (LCHF) diets in elite race walkers (n = 29 | Burke 2016). Accordingly, the subjects were in a slight but significant caloric deficit of ~400-450kcal of which Burke et al. expected that it would trigger a 1-1.5kg fat loss over the course of the 21-day study period. Figure 1: Graphical overview of the study design (I added extra info on the diet | Burke 2016). 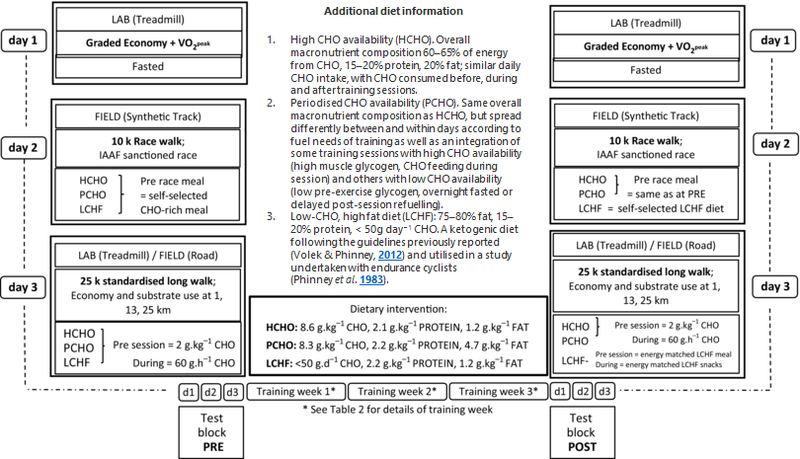 You can see all the details about the training and dieting regimens that included both, a high CHO, a cyclical / periodized CHO and the classic Volek / Phinney style ketogenic (Volek & Phinney 2012) diet in Figure 1 (please understand that the LAB, FIELD and LAB test were repeated before and after the training weeks which may be easily overlooked at the bottom of the illustration | see Table 1, too). 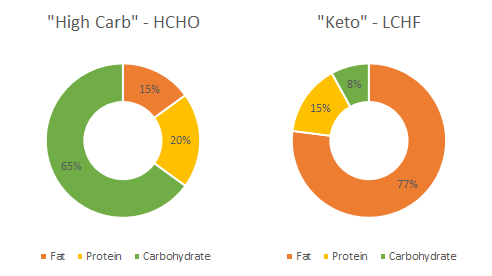 Figure 2: Pie charts of the relative contribution of fat, protein, and carbohydrates to the total nutrient intake of 40kcal/kg body weight (~2400kcal/d) the subjects received over the course of the 3-week study period (calc. based on Burke 2016). the ketogenic low-carbohydrate, high fat (LCHF) diet markedly increases rates of whole-body fat oxidation during exercise in race walkers over a range of exercise intensities. translated to real-life race performance decrements in the elite race walkers. Worth mentioning and actually something to consider for those of you who want the best of both worlds is that the periodized high carbohydrate intervention did not trigger a similar performance impairment in the highly trained subjects of Burke's latest low-carb study. The latest contribution to the accumulating evidence that a high-fat, low carbohydrate diet may, irrespective of any weight loss or health benefits it may have or not have, be not the ideal choice for athletes and wanna-be athletes comes from the University of Freiburg in Germany, where Urbain et al. found the previously cited "mildly negative impact from this 6-week non-energy-restricted KD on physical performance (endurance capacity, peak power and faster exhaustion)" (Urbain 2017) in a group of n=42 normal-weight, healthy adults who got less than 10% (< 20–40 g/day) of their daily energy intake from carbohydrates, 75% from fat, and 15–20% from protein over the course of the 6-week study. 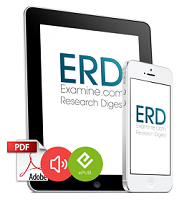 The subjects were free to choose the foods they were eating, the overall caloric diet was not restricted, and their adherence to the carbohydrate limit was tested by daily measurements of urinary ketones and keeping 7-day food records. 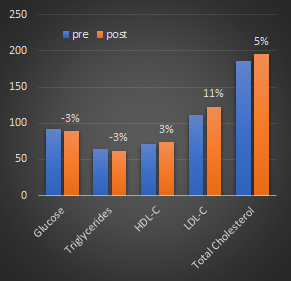 Figure 3: Changes (% relative pre vs. post change on top of the bars) in body composition, active thyroid hormone and resting energy expenditure from pre vs. post 6-week high-fat, low carbohydrate dieting in healthy subjects (Urbain 2017). mean daily caloric intake during the study did not change from the previous habitual diet (PRE 2321 ± 551 kcal/day, POST 2224 ± 584 kcal/day; P = 0.186). Whether or to which extent the weight loss was a side effect of ketosis is difficult to tell. What is certain, however, is that the subjects' adherence was, with 7.7% of the energy coming from carbohydrate and confirmed ketosis in 97% of the tests, excellent. "But eating a ketogenic diet will make you lose weight and improve your health..." While that is something you can read abou everywhere on the internet. The contemporary evidence is everything but clear. Yes, in the obese and diabetic, there's evidence that a ketogenic diet will produce both weight loss and improvements in metabolic health. Whether or not it does this more successfully than other sane diets (i.e. not the one recommended by the American Diabetes Association), such as a Mediterranian or a high(er) protein moderate fat and carbohydrate diet, is yet questionable - even in obese and diabetic subjects. Changes in markers of metabolic health in the Urbain study. As in comparable studies, lipids increased, glucose and the related trigs decreased - all within normal levels. The studies at hand, which dealt with healthy and normal-weight subjects, don't support the often heard of clear superiority of ketogenic dieting, either. And that's for both: Body composition, where the Burke study didn't find inter-group differences in weight loss (and did not assess body composition) and the Urbain observed a weight loss that could be due to a reduced energy intake in the early weeks, when many subjects reported side effects, but did not lead to an improvement in body composition. As well as the subjects' metabolic, which wasn't even tested in Burke et al. and about which we cannot make a definitive statement based on the ambiguous results of the Urbain study, where the blood lipids worsened (LDL and total cholesterol went up, HDL stayed the same) the glucose and insulin levels decreased - both within healthy limits, though). The participants' ventilatory threshold, their maximal heart rate and even the relative VO2peak (=VO2peak divided by body weight) were not affected by the KD intervention. Especially the latter observation is interesting. After all, it raises the question whether the statistically "large" effect size on the VO2 peak (d = 0.088) is practically relevant (and highlights the need to understand the underyling cause of the weight loss). Figure 4: Relative pre- vs. post changes (%) in Spiroergometry, EKG and Borg scale (Urbain 2017). In their own conclusion, the scientists point out that their results only partly conflict with previous studies. While both, Phinney et al. (1983) and Klement et al. (2013) found that the aerobic capacity was not compromised by a ketogenic diet and Zajac et al. (2014) even report a significant relative VO2peak improvement (probably a consequence of the sign. weight loss in the study), the more significant reduction in peak power Urbain et al. observed is in fact consistent with results others have reported (Zajac 2014, Klement 2013). Even in the previously cited studies by Zajac et al. (2014) and Klement et al. the peak performance dropped by 3.3% and 1.5% respectively. Bottom line: If we take the results of both studies, as well as related previous studies into account, it becomes obvious that both training status and type of exercise matter when we talk about the potential negative effects on a subjects' exercise performance. For endurance exercise in non-athletes, the previously discussed conflicting evidence suggests that the last word has not been spoken yet (the previously mentioned "opti-mized sodium and potassium nutriture" (Volek 2012) could make a difference here, as well). For endurance athletes, on the other hand, the increase in fatty oxidation does not appear to be able to compensate the lack of readily oxidizable glucose. Thus, "in elite athletes training and per-forming at intensities similar to elite sports competition, keto-adaptation is not the optimal choice" (Helge 2017). The study's main research focuses doesn't allow for conclusive statements about athletes and gymrats whose sports are mostly anaerobic, but in view of the correspondingly higher glycolytic demands of these sports, it's hard to imagine that (again all health and body composition goals aside) a sprinter or cross-fitter would be better off on a low carbohydrate, high fat diet. Whether the often marginal performance decrements outweigh the individual benefits on your well-being and/or body composition is something each of you will have to decide on his/her own | Comment! Klement, Rainer Johannes, et al. "A pilot case study on the impact of a self-prescribed ketogenic diet on biochemical parameters and running performance in healthy and physically active individuals." Nutr Med 1.1 (2013): 1-27. Phinney, Stephen D., et al. 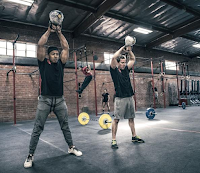 "The human metabolic response to chronic ketosis without caloric restriction: preservation of submaximal exercise capability with reduced carbohydrate oxidation." Metabolism 32.8 (1983): 769-776. Phinney, Stephen D. "Ketogenic diets and physical performance." Nutrition & Metabolism 1.1 (2004): 2. Volek, Jeff, and Stephen D. Phinney. The Art and Science of Low Carbohydrate Performance: A Revolutionary Program to Extend your Physical and Mental Performance Envelope. Beyond Obesity, 2012. Zajac, Adam, et al. "The effects of a ketogenic diet on exercise metabolism and physical performance in off-road cyclists." Nutrients 6.7 (2014): 2493-2508.